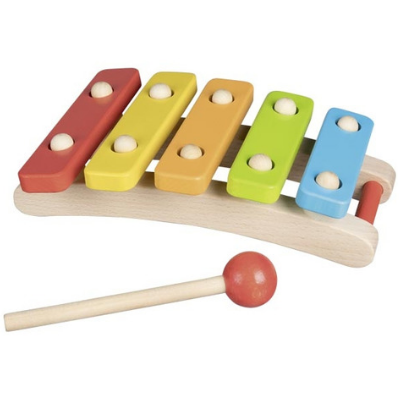 This chunky wooden xylophone is the perfect first musical instrument for little ones! This xylophone has 5 tone bars for a basic note range. It comes with a wooden mallet for striking the bars. Children can learn to associate the colours with different notes for easy composition. Undoubtedly one of the best features of this xylophone is the pleasant sound it makes. Helps children develop a sense of harmony and rhythm. Trains concentration, hand-eye coordination, and motor skills. Painted with water-based glaze paints in soft colours.